K9Style.net is the current hub for the business and personal webpages of Tara Lamper (the first "T" in TNT - Tara 'n Tripp). Peruse the menu for information and links. Professional canine cosmetology for the discerning pet owner. Located in the beautiful NH Lakes Region. For those inquiring minds who want to know, here is a little background on the site owner. Handy links to local business recommendations, interesting things to do around the area, and upcoming events. The Poodle has taken over! This (biggest) section of the site is all about Tripp, Tara's "famous" Parti Poodle. For those who prefer a holistic approach to wellness, we recommend doTerra EOs. 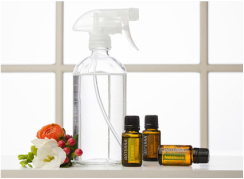 Essential oils are concentrated plant extracts that are used in a wide variety of applications: aromatherapy, topically for skin health or beauty, in food preparation, for natural antimicrobial cleaning, to boost the immune system, protect against "bugs", support physical, mental, and emotional wellness, to balance your energy... the list is endless! All content within these webpages - artwork, photos, text, etc. - is copyrighted. Don't be a jerk and use any of it without my permission.